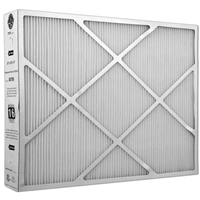 Lennox Healthy Climate Hepa-20 carbon inner filter. Recommended replacement every 12 months. Each individual filter is independent and can be changed. It is recommended that you replace your Lennox Charcoal Carbon Filter 92X09 every 2-5 years, for optimum performance. used independently. When connected to the return air duct, the HEPA unit diverts some of the return air into the three−stage filter. Then the cleaned air is returned to the return air duct to be heated or cooled. Designed to capture 99.97% of particulates 0.3 micron and larger of the air that passes through it. Unit can be installed in any position. Quiet operation. Generates no ozone. Constant blower operation will achieve the best air cleaning results with a continual flow of dirt laden air cleaned by the HEPA filter. Cabinet Constructed of painted, heavy−gauge galvanized steel. Completely insulated cabinet for quiet operation. The insulation also reduces heat loss and gain. Three−Stage Filtration Process Used to create the most effective filtration system possible. Each filter is independent and can be changed individually. Stage 1: Pre−filter − an inexpensive pre−filter to remove larger particulates from the air. This is important to prolong the life of the HEPA filter. Stage 2: HEPA − removes 99.97% of particulates 0.3 micron and larger. The air which is now almost completely free of particulates then passes through the third stage filter. Stage 3: Carbon − .50 in. thick carbon filter for removing chemicals and odors from the air. The Healthy Climate HEPA Bypass Filtration System also has an optional heavy duty granular carbon canister available for maximum removal of chemicals and odors. The clean air is then expelled from the unit to be introduced into the air you breathe.